As I was writing about the Odinic Rite’s Nine Noble Virtues, it became clear that I really should take a moment to talk about the Asatru Folk Assembly’s version as well. After all, they’re worded much differently so they require their own analysis. After careful consideration of them, the depressing truth is that they’re good enough to reveal how truly good they could have been had they been crafted with more forethought. In my opinion, an ethical code needs to have an eternal truth it grabs a hold of and lays bare for the world. This eternal truth can be very broad or very specific, but it needs to be there. Further, it also must be firm enough to offer a measure of guidance, yet flexible enough to be applicable to just about any circumstance. There will be questions that a code can’t directly answer, and that’s okay; it’s supposed to be a filter to view the world though as opposed to a sheet of instructions. Using your own heart and mind to interpret things isn’t just desired, but necessary. The OR’s NNV fail because they’re very narrow, internally redundant, and crafted to serve numerology over ethical introspection. The AFA’s, by contrast, is a handful of amazing ideas surrounded by the blatantly obvious. I get that their virtues are set up to provide a binary comparison to prove which quality you should most actively bring into your life…but at the same time, most of these comparisons are stupidly obvious. Look, I get it; honor is better than dishonor. The problem is that I understood that before I read the AFA’s ethical code, and even before I was Heathen. 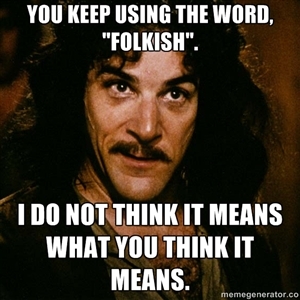 I understood this the moment I knew the definitions of both words, and I suspect I am no savant in this respect. Of the nine virtues they have, six of them aren’t outlining anything that will change how people see the world; do you have to point out that freedom is better than slavery? I mean, unless you are into that sort of thing of course. One way or the other, I don’t think Stephen McNallen is weighing in on bedroom practices. Strength is better than weakness. Courage is better than cowardice. Honor is better than dishonor. Kinship is better than alienation. Vigor is better than lifelessness. Yes, being alive and moving around is better than being stagnant and decaying; glad we cleared up the confusion. This isn’t philosophy, ethics, or anything very deep; it’s portraying two extremes as the only options that exist, and than pretending that this was some sort of difficult question. A good one, by contrast, is “Joy is better than guilt”. If this was another pandering paradigm, the other word would have been “sorrow” or “sadness”. The choice of guilt provides us with something to think on and consider. It’s better to be happy than to obsess over your wrong doing. It’s a denouncement of the theory of living in sin. It can suggest optimism, living with agency, or treating each moment as if it were your last. It can mean all of these things or none of them, providing a virtue that opens itself to the consideration of the one that follows it. I’m a little annoyed that it’s wording suggests that it’s talking more about theological based guilt possessed by from Christianity, because guilt wouldn’t be much of a consideration otherwise. It’s still going in the right direction, however. The best of the bunch, to my mind, is “Realism is Better Than Dogma”. It’s probably the only one of the virtues that I can appreciate without conditions, because it balances two things that can both be considered valuable in the right circumstances. You can use tradition and scripture…but all things being equal, chose the most pragmatic option. See, this does something that six out of nine virtues don’t; it prompts interpretation for the sake of our faith alone. The value of real world needs against the value of traditions for the sake of respect comes up frequently in Heathen discourse. Too bad they spoil it with “Ancestry is Better Universalism”. Well, perhaps spoil is the wrong word. I feel like it’s more of a subtle slap in the face to Paganism in general (and perhaps the Troth is particular), but this virtue still has a lot it can say. Considering that it’s being said by the AFA, however, I just don’t understand how it’s choosing to say it. In moderation, it’s brilliant; contrasting it with “Realism is Better Than Dogmatism” provides a very no nonsense rule of thumb; don’t do something just for the sake of tradition, but don’t forget that the traditions of your family made who you are. That can be powerful, meaningful, and deeply spiritual if you allow it to be. The problem come in when you take it at a greater whole. This is the same AFA that turns a blink eye towards white supremacists amongst it’s ranks. This is the same AFA whose members have had issues with people of other races professing to be Heathen. This is a group with a “don’t ask, don’t tell” approach to racially based hatred, and it makes their ethical code weak as a result. Is the AFA calling out universalism because they truly feel that disregarding the ways of your ancestors is cause for concern, or is it because many of these theological concepts come from non-Aryan people? Of the nine virtues, six are functionally useless. The three that are good are very good, but their message is diluted by principles that don’t have the same strength. Their function is rendered moot when compared to the organizational politics of the AFA. When I dug deeper, I found amazing things…but considering the source, I couldn’t blame anyone who refrained from doing that digging. I look at what many AFA members choose to stand for, and it makes it hard to view the group as anything but racists with fears of the stereotype. I had been ready to pretty much call it meaningless. Truth be told, I wish I still viewed in that manner. I preferred viewing it as a useless pile of pandering dross, over something beautiful ruined by pandering dross and bigots. The foremost I can mock and have a good time of doing, where the later just makes me feel frustrated and depressed. So where do we go from here? Is it wrong to try and have something like the Nine Noble Virtues, or have we just gone about things the wrong way? There is still the six fold goal to consider, or is it just another list of words? Next time, we continue to look into how Heathen ethical codes can operate. Author’s Note: I am well aware that one can be a member of the Asatru Folk Assembly and not be racially motivated bigot. I am not portraying all members of that organization in the light. I have heard that the leadership of the AFA combats racial problem when they see them. Regardless of what their intent is, however, it doesn’t change the prevalence of circumstances that seem to arise from that group. “We are our deeds”, after all. I view the organization as having a “don’t ask, don’t tell” policy in regards to racism. This entry was posted in Heathen Ethics and tagged Asatru Folk Assembly, Ethics, Heathen, Odinic Rite, The Troth. Is it terrible that when I read “honor is better than dishonor” I think of the Samurai Delicatessen (http://www.hulu.com/watch/4262)? You are absolutely right that six of the virtues are practically tautologies, one is just blatant name-calling (universalism being a term of Christian origin – describing a heresy! ), but the two that aren’t awful do give one pause for reflection. I like “joy is better than guilt” although I agree that the latter is also a term with Christian baggage, and “realism is better than dogma” is surprisingly refreshing. I just made a long and well-received comment about the worth of modern experience, so I’m behind that. However, I still feel that the virtues of any kind are still catering to people looking for cut and paste spirituality, or perhaps rather flow chart ethics, where you simply run your finger down a generic list to see if and how you messed up and how to ameliorate the situation. The whole point of heathenry, paganism, and other free form pre- yet post-Christian religious philosophies of the West is that we are walking away from holy books and “one right way” and “always/never, because I said so!” Yes, that means when you screw up you spend a lot of nights tossing and turning about it, and without a form of penitence or forgiveness you may never feel okay with what you have done (or not done), but that’s a small price to pay for ecstatic experience and rewarded faith without a guidebook or priest or oversight council. The most tragic thing about the universalism line is it didn’t *need* to be a pot shot; it could have been an appropriate part of something that was better written. When contrasted off of the line about realism? That’s a compass. Not one that spells anything out for you, but one that gives you a rule of thumb. Ethical codes are often just checklists, but I will contend that they don’t need to be. 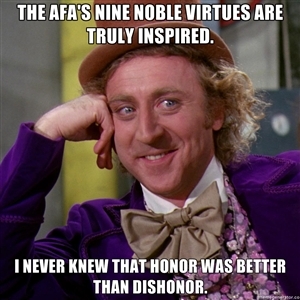 I have massive problems with the AFA’s politics, but this version was almost something truly good. With a little more forethought, this format of putting a greater than/less than sign in between two concepts could have been amazing. Powerful enough to be meaningful, simple enough to be easy to memorize, but vague enough to have to require personal rigor to use. Your mileage may vary, of course..
Mrr. I’m aware that not everybody in the AFA is a racist bigot in their direct action. However, if you’re not yourself overtly racist, but have no problem with your friends being racist… do I really want to be your friend? Similarly, I don’t find “Ancestry is better than Universalism” at all useful, because putting them in direct opposition that way betrays a general lack of understanding what Universalism actually means, which means the context is the perpetual “Folkism vs. Universalism” argument I’m really tired of seeing in the Heathen population. Which is to say, I like your post, thank you for making it. I’ve got some very close friends in the AFA. Friends who I’ve known for a long time, and who have been frithful to me on countless occasions. First of all, throwing them to the wolves based on the other people who show them respect…that shows badly upon me, not them. Also, it’s interesting to note that they’re experiences have varied greatly from some of the horror stories I’ve heard. Does that discount those stories? Of course not…but it’s worth considering upon all the same. I’d like to believe that 90% of us are good people…just we have 10% who can’t act like human beings. I want to focus on that 90%. If it doesn’t exist, I’d like to encourage it. I don’t have any *close* friends in the AFA, but I do have quite a few apparently reasonable acquaintances who are in the AFA or in AFA kindreds. But the more time passes, the more I see problems, the more I question their willingness to stay involved in those groups. Granted, it no doubt varies, but not enough for me to be at all comfortable with the implications. If a person can have a rational conversation with me about what they see there, why they’re there, why they stay, maybe. As you say – I’m not going to just throw an old friend out of my life for it without discussion and consideration. But it seems like quite a lot to turn a blind eye to.